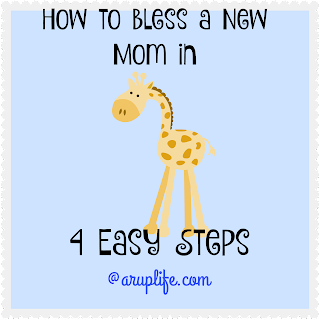 A RUP LIFE: How to Bless a New Mom in 4 Easy Steps! How to Bless a New Mom in 4 Easy Steps! Having a new baby is a big adjustment to any family. Going from three to four kids has been interesting. I wanted to share some tips on how YOU can be a blessing to a family with a new baby. I know this seems rude but honestly most days I am in my PJs and not ready for visitors. It also helps me plan the baby's feedings and diaper changes so he is ready to visit too. If everyone is napping - we most likely didn't sleep the night before. Don't plan on staying for hours on end. Chances are that new mom only slept 45 minutes combined the night before and is exhausted. She probably took her few minutes of quiet to shower for your arrival since it had most likely been 3 days since her last washing. Look for signs of fatigue and take that as a cue for your visit. Bring Momma something to eat. Dinner, dessert or snack. I promise you she will be eternally grateful for any type of food. It doesn't have to be homemade either! Rotisserie chicken is wonderful! Cookies from the supermarket are divine! Moms can feel alienated after bringing baby home. Most of the time the 'lying-in' means staying home for a few days or weeks. Every text asking me how I was doing was so sweet. It really meant a lot to me during that time to know someone on the outside cared enough to ask. Asking how baby is doing is equally wonderful! If your planning on a visit it is wonderful to ask if Mom needs anything. I was out of paper towels the day a good friend was stopping to visit and she had asked if I needed anything. It was such a blessing that she picked a roll up for me to get us through the day. Another friend picked up the slack on an event I was supposed to bring food to by making the food for me. These were both HUGE blessings to me. Hope these tips help! I honestly can tell you that during the last few weeks all these tips came to pass and there were many people that were huge blessings to our family. Definitely call first! I can live without the rest, but that's my biggest request. Even now that baby is older ~ please don't just "drop-in" on me unexpectedly. We homeschool, little ones nap, and I don't post on Facebook every time someone is sick! Definitely even "just" a rotisserie chicken. When my oldest was a newborn, my husband's aunt knocked on the door, shoved a bag of food through, and left. It had a still-warm chicken and a deli container of potato salad. I admit, I cried when it meant I didn't have to figure out dinner.